'I Choose You' 3 Winans Brothers Feat. Karen Clark Sheard remixed By Louie Vega is the very reason house music is known around the world as A SPIRITUAL THING! House and Gospel have shared a dance floor from the very start thanks to pioneers like Louie Vega who harness the joy and inspiration of Gospel with the motivational energy of House. Never was this more evident than in the 1st project Louie Vega and 3 Winans Brothers Featuring The Clark Sisters came together for in 2015, DANCE which was a world renowned sensation and the catalyst for 'I Choose You'. 'I Choose You' is the result of a combined 20+Grammy Award Winning artists THE WINANS BROTHERS & KAREN CLARK including our very own Louie Vega's Grammy win bringing forth music that not only stands out but is an undeniably exceptional sound that will undoubtedly reaching past the top of the charts to blaze a path for music that celebrates being thankful for the life we are given! The 3 Winans Brothers, Bebe, Marvin and Carvin, have come together yet again with their love for writing, singing, and performing music with 'I Choose You'. Karen Clark Sheard having laid down new vocals produced by Bebe Winans himself coupled with the additional Winans soulful vocals completely enhance the reaffirming message 'I CHOOSE YOU... the POWER of HIS Love, I could NEVER deny it'. 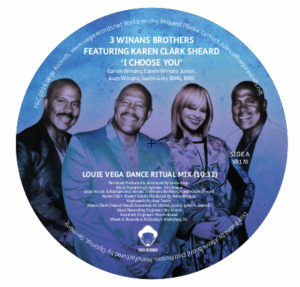 Louie Vega has once again delivered the ultimate composition and arrangements to complement the beauty that lives in the message of 'I Choose You' and brilliantly elevates the powerful voices of the Winans and Karen Clark Sheard that bring that very deep sentiment of hope and light forward. For music with a message as enlightened as the one in 'I Choose You' Louie enlisted Axel Tosca of Elements of Life band, the Cuban born pianist with an intense passion to bring any keyboard to life who transfers that energy into this exceptional piece. Every single harmony, each key, all seamlessly aligned with in various mixes with engineer Yas Inoue of Vega Records on the boards so that 'I Choose You' can be enjoyed by those looking to fuel packed dance floor or their own individual playlists. The icing on the cake are the new vocals by Karen Clark Sheard, where she is testifying and ad-libbing powerful messages to the world! 'I Choose You' 3 Winans Brothers Feat. Karen Clark Sheard remixed by Louie Vega drop at all vinyl outlets ....AND be on the look out for future performance dates in your country and city.... this message is going world wide!